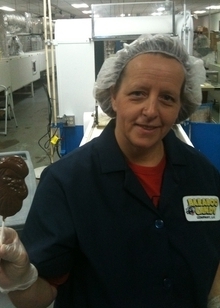 Baraboo Candy Company has been producing chocolate goodness since 1981. Home to The Original Cow Pie, a delicious treat consisting of pecans covered with caramel and smothered with rich milk chocolate, Baraboo Candy also produces over one hundred varieties of delightful treats. Recently, I had the chance to spend the morning with Baraboo Candy plant manager Tina David, who showed me around the plant, and shared some of her experiences while producing such tasty products. Tina, I have to say that you have a job that many wouldn’t mind having being you're surrounded by sweets. Did you always want to be in the candy making business when you were growing up? TINA DAVID: I really did. My mother started working at the chocolate shop way back when, when she was eighteen years old, on State Street in Madison. That was always her love, and we made a lot of candy at home as kids growing up, so I always had an interest in it. At that age I generally knew how to do a lot of it, so it was just a natural progression to come here. I live in Baraboo, but I’m originally from the Black Earth/Mt. Horeb area. What is your favorite aspect about working in a chocolate factory? It does smell really good in here! After sixteen years of it though, do you ever get sick of it at all? What’s your least favorite aspect of the job? Long hours. 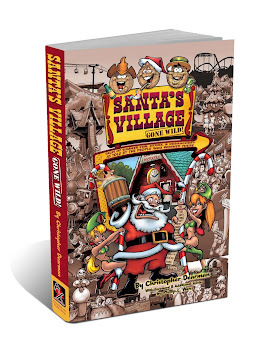 Like right now being the Christmas season, we’re extremely busy. So, the days go very quickly, which is nice, but there is a lot to do in a short period of time. Its eight hour days, sometimes ten to twelve, but there just doesn’t seem to be enough time in the day to achieve everything we need to get done. You know, we want to make sure everyone has a great Christmas and get what they want, but not having the insight of knowing what they are going to order, makes things difficult at times. So you guys have to try to predict what is going to be the biggest sellers this time of year, so you can produce enough products? Correct. It always changes for people and their tastes, so you never know what’s going to come down the pipe. Tell me a little about The Original Cow Pie – how did that come about? Well, we used to make what we called the Jumbo Pecan Puddle, and it was about a three ounce dollop of Carmel, on a bed of pecans, covered with chocolate. One day, a few of them got thrown down the belt upside down and my boss at the time said – Oh my gosh, it looks like a cow pie! – and that’s how it all started. Do you know how many other varieties of candy do you make here? Oh my goodness, I don’t know, but I would have to say at least a hundred different types – quite a bit. I imagine that the most popular is the Cow Pie though? Yes it is. Our three most popular would be The Original Cow Pie, the Moo Chew, and the Udderfingers. The Moo Chew is a chocolate covered caramel, the Udderfinger is our chocolate covered toffee, and they kind of look like cow utters, hence the name. We also have a newer product that’s been out for about two years now, the Peanut Butter Cow Pie, which is made with peanuts, and has a big slab of peanut butter in the center, with caramel, and then covered with chocolate. Do you know approximately how many cow Pies do you make a year? That’s a lot of candy! How many employees does it take to make all that? Four, I have four employees in the back. A very small crew to accomplish some pretty big feats. It’s a lot of teamwork, and we are a good team. You said that you came up with The Peanut Butter Cow Pie a couple years ago. How do you come up with new stuff, is it just trial and error? It’s definitely trial and error. The Peanut Butter Cow Pie was actually my idea, I created that, and it’s doing very well. So you just come up with ideas by working with the stuff all the time? Correct. We have a lot of ideas at times, but we have to figure out ways to make them work, and make them work efficiently. Sometimes that’s the problem. Everyone has a lot of ideas, but it’s getting it to work efficiently that is the biggest barrier. What’s the most candy you’ve eaten in one sitting? (laughs) I don’t really just sit down to eat a lot of candy in one sitting, but I do, do a lot of quality control testing! Chocolate is my favorite. Just plain chocolate. Never get sick of it? No, our milk chocolate is very good. What’s the most memorable thing that has happened here over the years, anything funny ever occur? Well, I’m not sure if you know the I Love Lucy episode where they are on the end of the line, and the candy starts coming faster and faster? Of course, it’s one of my favorite episodes. Well, we do that as kind of an initiation to our new employees sometimes – that’s probably the funniest thing we do. They think they have it all down and they know what they’re doing, then things will just start coming faster and faster! (laughs) It’s kind of fun to see what kind of panic they are going to go into and what they are going to do with the candy when they can’t quite pick it all up. I bet that would be fun to watch! So, since you work with it all day, d you ever have dreams of making candy? Oh yes! I do. A lot of times when I’m supposed to be sleeping, I’m thinking about how we’re going to get all this stuff done. Can you share anything about any future plans or tease any future products? Right now, being our busiest time, we will work on new products in January and February when things kind of mellow out for us here. Right now, we’re just pushing out all our original items because we are having a really tough time keeping up – but we are keeping up. That’s why I just keep moving along here while we’re talking (loading candy on a conveyor belt to be covered in chocolate), because we got a lot to get done today! Well, I’ll let you get back to work, I know you have a lot to do. Thank you for taking the time to show me around and answering my questions. It’s been a very informative, as well as very tasty, experience!